Following the multiple course announcements for the 2019 Haute Route Cycling Series last week, details of another event follow today with the announcement of the 2019 Haute Route Norway (August 2nd-4th) course. Starting 292m beneath a Norwegian Fjord, the course for the 2nd edition presents several new features as well as many of the roads that made it such a popular event last summer. A one-time only affair, the Haute Route is extremely lucky to be able to start the first stage in the Ryfast tunnel before it is opened to the public later this year. Based in the seaside town of Stavanger, Haute Route Norway is the ideal event for riders looking to discover a vibrant new cycling destination as well as riders looking for their first Haute Route experience. Starting in the Ryfast tunnel (the longest undersea road tunnel in the world at 14.3km in length) under the Fjord on the first stage and at the foot of the Lysebotn climb after a ferry ride for the second stage, the event is guaranteed to deliver memorable moments. Visit Norway, experience the best roads the Stavanger region has to offer for cyclists and enjoy the many activities and attractions with your family and friends in and around Stavanger. From the towering Fjords, rolling hills and quaint fishing villages to the empty wide-open roads you’re sure to enjoy your Haute Route cycling in Norway. Discover the stunning roads, towering fjords and empty roads of the Stavanger region. Starting 292m below sea-level in the Ryfast tunnel on the first stage and at the end of the Lysefjord in Lysebotn on stage two, live a series of memorable moments on the most accessible and unique Haute Route course in 2019. Starting 292m below sea-level in the Ryfast tunnel, the opening few kilometres of this first stage are sure to be memorable as the riders make their way uphill towards the fresh coastal air. Exiting the tunnel, they will have to climb a further 280m to reach the summit of Heia before heading along the coast and up the Fjord to take on the climbs of Krågåsen and Meltveit. Retracing their steps along the Fjord, the final part of the stage loops around the peninsula and take riders over the Kyrkjebakken climb towards the finish line in Jørpeland. The Compact course on this stage covers the same route as the Original course except for the Krågåsen climb and the Fister loop. Travelling to the start of the second stage by Ferry across the Lysefjord, riders will be able to appreciate stunning views of the Kjerag Rock and Preikestolen (two prized tourism attractions of the region) on their way to the start line. Starting in Lysebotn at the foot of the Lysebotn climb (known as the Norwegian Alpe d’Huez), the first part of the stage features the most demanding climb of the event. Rising to 896m over 9km for an average gradient of nearly 9%, it will undoubtedly present the biggest challenge of the weekend. 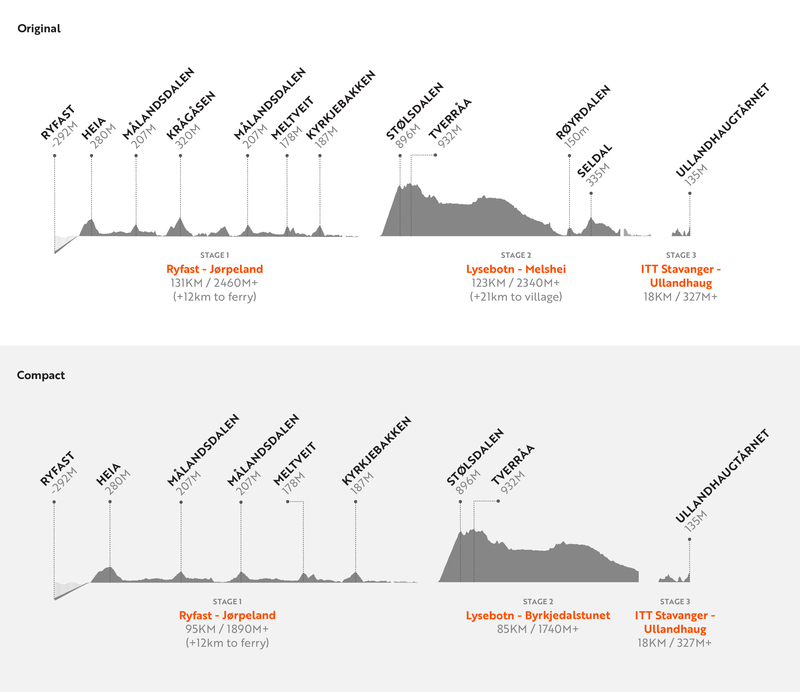 Following this ascent riders will take on a series of rolling hills before descending all the way towards Byrkjedal to take on the final two climbs of the day up Røyrdalen and Seldal. To reach the finish line in Melshei riders will also have to overcome one final uphill kicker, the last climb between them and the time trial on stage three. The Compact course on stage two will cover the same first part of the stage as the Original course, over the Lysebotn climb, but will finish in Byrkjedalstunet after 85km of riding. The third and final stage of the 2019 Haute Route Norway will be an 18km time trial in and around the town of Stavanger. The first part of the stage will feature the same roads as the one used in the Tour des Fjords and Hammer Series, before passing by King Harald V’s residence in Ledaal. Riding past the DNB arena and towards Ullandhaug, the next section of the course passes near the Swords in Rock commemoration before an 11% climb up Madlalia. The main climb of the day comes just 1.5km from the finish with a 17% slope up Grisabakken before a short flat section and final 12% climb of 250m to reach the finish line at Ullandhaugtårnet. Able to celebrate their achievements at the finish, riders will be greeted with a 360o panoramic view over the Fjords, the ocean, and the mountains to finish their weekend.